Today, it’s another special request: in this case, a quick d20 setting. Iselin is an old world. The quasi-reptilian elder races – the dragons, gargoyles, lizard-men, and others – had long ago been granted inherent magical gifts by the gods according to their measure, had established their domains, and had settled into their own ways. “Primitive” some – such as the lizard-men – might be compared to the high councils of the dragons, but their ways suited them, and the spirits of the land, sky, and waters, favored the children of the gods in their long dreaming. No one remembers why the younger races intruded upon Iselin. It might have been in flight from some disaster (according to the Dragons, likely of their own making). It might have been the simple desire for new lands to expand to. It might have been simple curiosity, or an inherent tendency to meddle. Regardless, the awakening was a rude one. The newcomers saw the gods as creatures like themselves – as exaggerated kings, emperors, and squabbling siblings rather than as primal forces. They actively drew power from the world, rather than accepting what flowed to them naturally. They imposed themselves upon the world, raising cities and shaping the lands to their will. They spread across the broad plains of Korinth – a land little used by the elder races, but well suited to the newcomers. They extended outposts to the Sier Coast and Randu Bay. They did many new things. But one mighty magician-emperor went too far. He attempted to seize immortality – such as he believed that the dragons possessed – from the gods by force of will and epic sorcery, to extend his reign to the very end of time. What he accomplished was to blight his realm, to doom himself and many of his people to a horrific, cursed existence as the first Undead, and to taint the world with a variety of horrors. The forces he had unleashed even twisted many members of the elder races who had been unfortunate enough to have been drawing on the wells of magic at the moment the attempt was made. Maddened and evil, they became a menace to everyone around them. The undead horde surged out from Korinth, laying waste to the lands. Eventually the remnants of the Dragon Council took action: the plains of Korinth were reduced to ash and sand, the undead bound and cursed again with a vulnerability to the sun, and seals were laid while the dark hordes were forced below ground during the day. Since then, many centuries have passed – and, despite the madness and negative-energy powers that lie hidden in the old bloodlines, civilization has rebuilt. Most of the elder races have forgotten why the younger races are dangerous and to be avoided, but the Dragons maintain a wary watch over their doings. 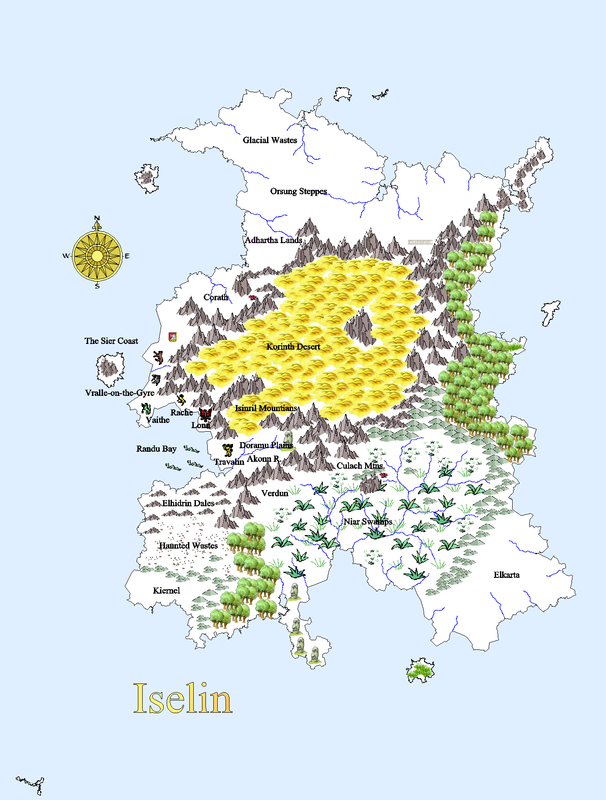 The Elhidrin Dales are a collection of rugged hills and modest valleys, inhabited by a selection of small communities, mostly surviving in substance farming, harvesting lumber, trapping, and fishing. Despite the rumors of mineral wealth and lost treasures, few venture back into the depths of the hills; the locals are all too aware that the maze of the hills also shelters a variety of twisted monsters and evil spirits wandering out of the haunted wastes. Those who live here are well advised to have their homes built sturdily, to keep them well-blessed, to keep their windows small, and to keep their doors barred at night. To open such a redoubt to a passing traveler is to invite possession, transformation into a lycanthrope, or worse. Verdun, linked to the coast only by a few perilous passes, harvests the products of the Niar Swamps and trades with the inhuman creatures which inhabit the area. While the land is unfriendly and plague-ridden, there is profit enough in the exotic herbs and spices to be found here to attract and sustain a modest population – all of whom know better than to take much notice of the occasional depredations of the Gargoyles. Ominously, Trevalin is built upon the foundations of the far older, and long-buried, city of Ralis. Deep beneath Travalin, in the crypts of ruined Ralis, lie ancient artifacts and crumbling crypts, populated by lost remnants of the ancient undead horde of Korinth which once overran the city. There, gradually bringing under his control the remnants of the forces which once destroyed him, Lord Tauren – once prince of Ralis, now himself undead – awaits his long-anticipated release. Far to the east of Travalin, the spires of the Culach Mountians rise from the Black Swamps of Niar. Here, under the rule of the Immortal Lord (actually a polymorphed dragon, driven mad by the Great Curse of Korinth long centuries ago) the Gargoyle Kingdom waits to take advantage of whatever weaknesses should develop in the lands of the young races. The wealth of the Isenril Mountians lies in valuable magical ores, which have inspired men to drive deep tunnels into the very heart of the mountains, where things have been disturbed that normally lair far away from the haunts of men. Still, the digging does not cease. The city-states of Sier have, of course, also taken an interest in the Isenril, as their rulers seek additional sources of funds to pay for their constant warring and hiring of orcish mercenaries. Corath is chill and intemperate, it’s various tribes loosely united under the ferocious rule of the Makannth (“Great Warleader” is perhaps the best translation). Glorying in combat and the military virtues, the people of Corath seem to regard military service further south as a basic training exercise for young warriors – preparing them to serve in the endless conflict with the Adhartha Nomads who populate the plains and steppes to the north. Of course, they may also be simply spying and preparing for an internal conquest: attempts to expand to the south have been frustrated for centuries by the near-impossibility of dealing with the endless series of strongpoints which the Isenril mountains make available. Perhaps fortunately (given that the culture resembles a cross between the Mongol Horde and the Roman Imperium), the population of Corath is relatively small; there simply isn’t enough food available to support more – another reason for serving as mercenaries. The Adhartha Lands support few truly permanent settlements and none of any great size: the climate is too harsh for it. On the other hand, the migratory nomads which sweep back and forth across the northern end of the continent with the seasonal cycles of the snows offer few attractions for anyone save the occasional trader seeking ivory, furs, and gold – all of which are to be found in the distant reaches of the north. The nomads are, however, trained to a constant wariness and readiness for war by the depredations of the various cold-loving monsters which lair on the glaciers of the North and amidst the icy peaks of the mountains. Interesting, might be fun to play in at some point. I always have a few character ideas out there that might be fun to bring out at one time or another.